I think the idea of taking the flavors of one type of dessert and putting them into another type of dessert is so much fun. Different textures in one dessert also adds interest to it. I know I prefer something with different textures, even something as simple as a chocolate chip cookie. A chocolate chip cookie has smooth and creamy chocolate chips with a chewy or crisp (or both) texture so you eat both at the same time. 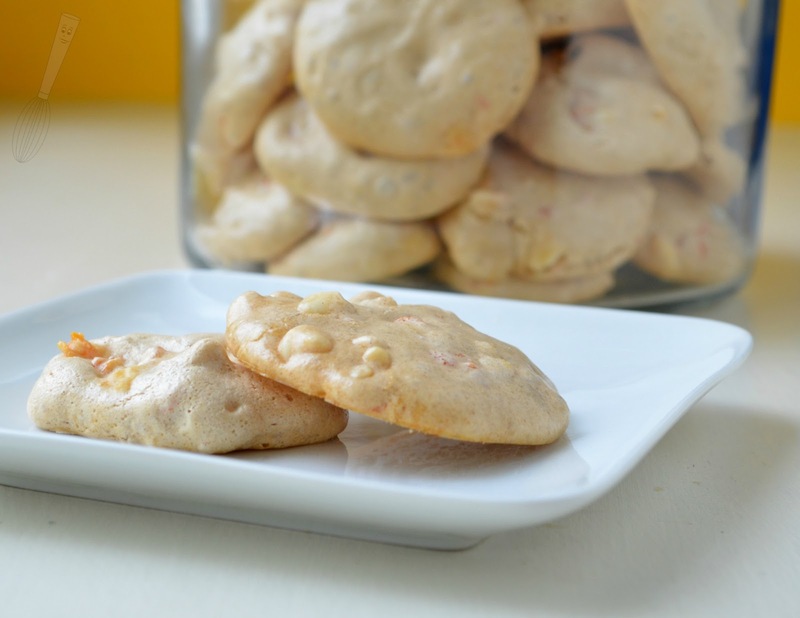 These cookies combine smooth and creamy white chocolate chips, homemade candied carrot pieces, and cinnamon in a brown sugar meringue. The result is a crispy on the outside and soft melt in your mouth inside. Candied carrots sound a little odd probably but carrots are naturally sweet and this is a perfect method of preparation for them that could be used in so many desserts to add some color, flavor, and crunch. The candied carrot pieces are a little crunchy, just like candied orange peel would be. I only used two carrots but as you can see it ended up being a pretty good amount. I didn't measure the actual finished amount though, so if you use smaller carrots obviously you would end up with less candied carrots, which isn't a bad thing necessarily. I will say that I had the pile of them on the cutting board and my son saw them. He loves carrots so he thought these were the best little things ever when he tried a little and kept asking to eat more of them. I'm probably lucky I got as many of them as I did into the cookies. 1. Preheat oven to 250F. Peel the carrots and trim the tops and bottoms (if necessary). Using a peeler or a knife, peel the carrots into thin strips. In a small saucepan, stir together the water and 1/2 cup granulated sugar. Add the carrots to the water-sugar mixture and bring to a boil. Cook for 4-5 minutes or until the water-sugar mixture is reduced to a syrup that coats the carrot strips. 2. 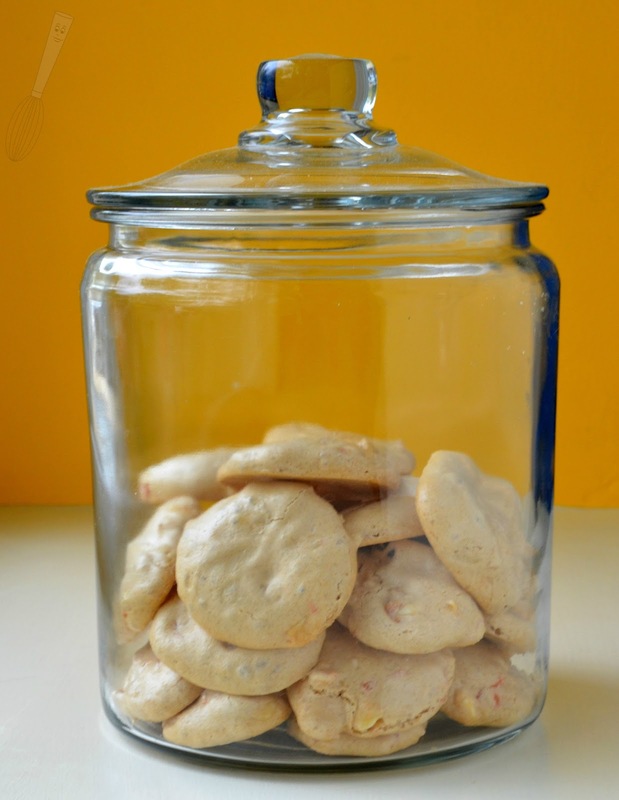 Place 1/4-1/2 cup granulated sugar in a medium bowl and add the candied carrot strips. Toss, using two forks, until the carrot strips are all coated and not clumped together anymore. Place the carrot strips on a cutting board and coarsely chop, set aside. 3. In a mixer, whisk the egg whites until frothy, then add the cream of tartar. Continue whisking the egg whites until soft peaks form, then add the cinnamon. Add the light brown sugar, 1-2 tablespoons at a time, mixing in between additions. Continue whisking the mixture until stiff peaks are formed. 4. 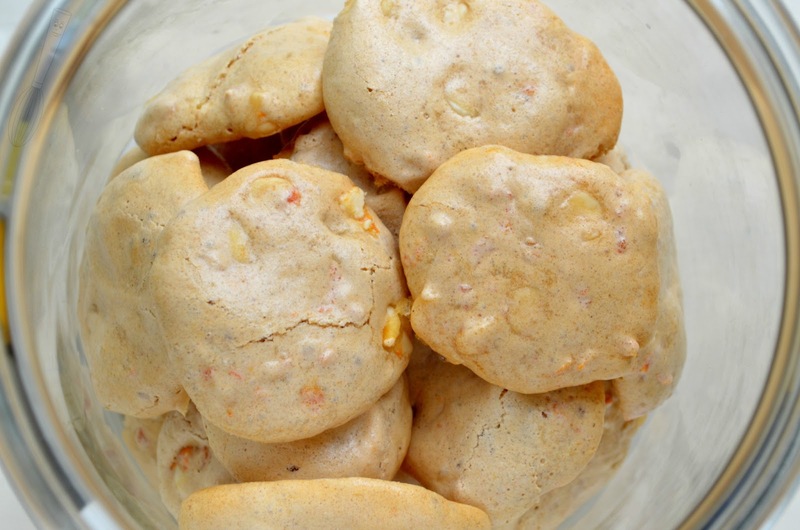 Fold in the carrot pieces and the white chocolate chips. Spoon the meringue onto a sheet pan lined with a Silpat or parchment paper, in 1 tablespoon portions. Using the back of a spoon or a small angled spatula, flatten the cookies to about 1/2” thick, so they are about 2” wide. Bake the cookies for 35-40 minutes or until golden brown. Remove from oven, let cool several minutes, remove to a cooling rack to cool completely. Don't forget to follow me on Blog Lovin' so you don't miss a recipe!